Clothes piled up on my closet floor because I hated how long it took me to put them away. When they were put away, I couldn’t find what I wanted because my closet was stuffed with clothes. When I went clothes shopping, I invariably came home with another pair of black pants to add to my enormous collection or the latest fashion that went with absolutely nothing. I needed help. Do you? Yes, Mother (that’s what I call her when she gets high and mighty like that), I did and I’m GLAD! To be honest, I thought I was nuts for taking a class, too. After all, I know the importance of decluttering clothes. I was doing that regularly, but since I store all of my clothing in one closet, it was still a challenge to choose which clothing to give away. At one time, I kept my off-season clothing stored away. But living in Missouri means that you need access to all kinds of clothing all the time. I wondered what else Brook could teach me that would make a difference. Organize your wardrobe by outfit and accessibility. At the time I started my class, my clothing was organized by color. It wasn’t bad. In fact, it made my closet look more attractive and gave me some ideas for outfits I hadn’t thought of before. But I had some problems. The items I used most often were the least accessible. I have limited drawer space, so all my pajamas are hung in my closet. I wear them most often, but I stored them where I couldn’t reach them easily. That’s one reason they ended up on the floor, rather than hung up. I decided to store my pajamas in the center of my closet, between the two sets of seasonal clothing. I also store jackets here. Holiday and formal wear are now stored in those hard-to-reach places. I know. A Ph.D. should have been able to figure this out, but alas. I needed Brook. The second accessibility issue made a huge difference in keeping my closet floor clean. Rather than storing empty hangers all throughout my closet or at the inaccessible end, I started storing them all in the center of the closet. Now I can easily reach empty hangers. I don’t have to flip through every piece of clothing looking for a spare. Again, I’m rather appalled that I hadn’t figured that out before. It’s required me to form a new habit of always moving empty hangers to the center, but it’s going great. Organizing by outfit also made it easier to decide which clothes had to go. If I found a shirt that went with nothing, for example, and I wasn’t wild about it anyway–out it went. In the past, I kept things if they fit and were in good shape, even if they didn’t coordinate with the rest of my clothing. Organizing my closet by outfit allowed me to determine what I still needed. I made a list of pieces I wanted to buy that completed outfits. I also added jewelry to the outfits that was purchased for them. I discovered there were some jewelry pieces I needed to buy as well. The first time I went shopping after organizing my wardrobe was amazing. I steered clear of the black pants and got a few inexpensive pieces to finish outfits. Shopping was not only easier, but cheaper! What do you think? 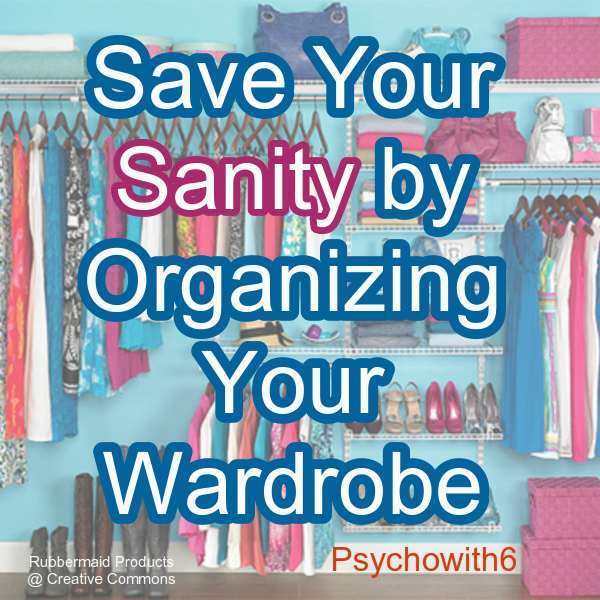 Would organizing your wardrobe by outfit and accessibility restore your sanity? I love organizing – and reading about organizing! It was fun to hear about your experience, Melanie. I went on a two week trip a couple of months ago and lived out of a small suitcase the whole time. I loved it because there were so few decisions to make about what to wear. When I got home, I got rid of half the clothes in my closet – not for good – I just moved them to an unused closet to see if I really wanted to get rid of them. Now almost everything in my closet is something I wear – will fine tune it more at some point, but I’m loving the “less is more” approach. I was inspired to try it after reading “Seven” by Jen Hatmaker. That’s great, Barb. I know most of us could get by with much, much less! I’ve heard about Seven. I’ll have to give it a read. Thank you so much for this! I will be starting a job at a law firm this coming summer and it will require early mornings and long hours. I know an outfit I like when I see it, but am completely at a loss for putting separates together that look stylish at a moment’s notice. I know a lot of websites say get a lot of separates that you can mix and match, but for me that just makes things more confusing for work wear and I end up wearing very similar to the same thing every day. Styling my wardrobe by outfit (either put together on a shopping website or with help of pictures and a stylist at the store) will make sure I look appropriate on a regular basis while knowing that every morning I have a great outfit waiting for me!! Lilly, I’m so thrilled this was helpful. It really does make sense to plan once so you can grab and go.